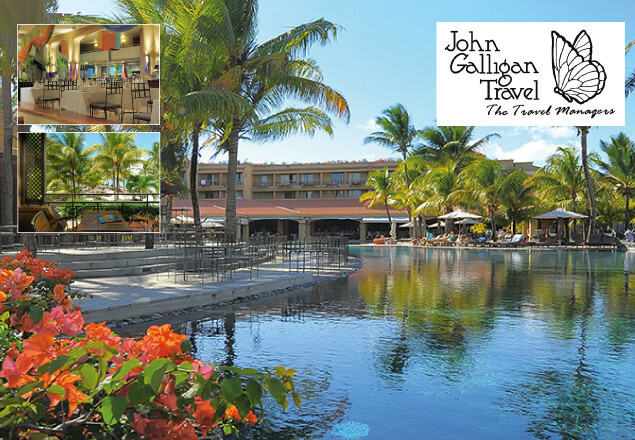 John Galligan Travel have teamed up with Rewarding Times to offer you an opportunity to experience one of the most stunning tropical islands in the world for almost as cheap as a holiday in Europe. Mauritius is surrounded by a calm, balmy lagoon making it one of the safest places for water sports, beach lounging and sunbathing. Ideal for couples, families and (now) golfers. The fusion cuisine has to be tasted to be believed and the Mauritian people are a pleasure to be around. The pampering service you will enjoy is bordering on the decadent! Exclusively for the Rewarding Times readers – a week’s holiday at Beachcomber’s lively Mauricia Beachcomber Resort. Located in heart of the liveliest resort town in Mauritius and near the capital, Port Louis, it is an ideal place for fun in the sun. Right in the heart of lively Grand Baie, on the sun-drenched northern coast of Mauritius, Mauricia Beachcomber enjoys the sweeping views of the bay, while being walking distance of the village of Grand Baie, one of Mauritius’ main tourists’ hubs, with all its restaurants, bars, discotheques and boutiques. This resort is an ideal choice for young couples and families, looking for a bit of fun. Guests at Mauricia Beachcomber have full access to the facilities of the nearby sister hotel Canonnier Beachcomber, thus expanding the beach, leisure, sports and dining options greatly. Les Quais is the main restaurant serving International cuisine for breakfast, lunch and dinner. Le Nautic is the seafood restaurant and is designed on a split-level overlooking the sea. Timber flooring and contemporary teak furniture complete the venue’s minimalist chic. Bay Watch Bar is the main bar, facing onto the bay where many pleasure boats are moored. Guests can have a quiet drink looking at the sunset. Open until late, the bar is also a nice place to enjoy the hotel’s live entertainment at night. La Rhumerie is the underground disco for underground music lovers. Bop till you drop. You can continue on into Grand Baie for more late night activity afterwards. Mauricia Beachcomber is a great family resort. There is a huge range of activities and free land & water sports for all ages. The resort has a lovely wellness centre with special massages for children. Key to a great holiday for the children is the magnificent Kids Club. This is for kids aged 3 to 12 and is housed in a cosy venue located a few metres away from the beach. A lively and engaged animation team will keep the kids stimulated and busy. Be warned though, they may want to spend more time there than with you! Kids activities include tennis, water-skiing, glass-bottom boat trip, modelling clay, Indian night, mask making, building sandcastles, henna tattoos and lots of other games and activities. The Mauricia Beachcomber is a charming hotel with a lively vibe, perfect for young honeymooners looking to unwind as well as make the most of the entertainment and activities. It represents good value (discounts for honeymooners), excellent cuisine, a fantastic location that can be quiet or very lively depending on where you choose to go. The Honeymoon Suite is a wow! Pure white beaches, diving sites and nearby tourist attractions offer guests the opportunity to discover part of the natural beauty of the island and take home unique memories of their tropical honeymoon. There is a sports centre for your health and fitness. Professional trainers and supervisors are available. After a good work out, enjoy relaxing in the sauna or hammam. Choose from a game of tennis, or a volley ball or a bocciball match with friends or family. For the more experienced tennis players, a match against one of the professional coaches could be a fun challenge! Mountain bikes are available for a trip off the resort. You can also use the facilities at nearby Canonnier Beachcomer. Le Mauricia is set in one of the most scenic bays on the island. The boathouse is the hub for an extensive range of water based activities. Water skiing, snorkelling, sailing and scuba diving, are available for guests of all ages to enjoy the warm waters of the north coast of the island. All activities are supervised by experienced instructors. Mauricia Beachcomber offers one of the best sailing sites on the island. Its calm waters are very pleasant for a relaxing day cruise on a catamaran, where guests will also enjoy all-day refreshments and a delicious lunch onboard. There is a wide range of room types to suit every accommodation need and budget. From Standard rooms, ideal for couples to Family Apartments and Villas. All are located close to the main reception and are very tastefully decorated and furnished. Mauricia Beachcomber features a lovely wellness centre. It has cabins designed to resemble nomadic tents, cleverly designed around a shaded pool. Enjoying a quiet location remote from the hotel’s main hub of activities, it resembles a private villa and exudes a sense of warmth and modern comfort. Evoking the ambiance of a typical Moroccan medina, ten cabins linked together by a series of arches open onto a central courtyard complete with a symmetrical reflecting pool bathed in natural light. A large wooden deck frames the entire pool. Mauricia Beachcomber’s Diving School is very close to all the diving sites in the north of the island. Most of these are between 15 to 25 metres deep and they constitute a real delight for underwater photographers. A five- to twenty-minute boat trip will take you on these sites. For the more adventurous, dives at ‘The Wall’, at Gunner’s Quoin, may also be scheduled. Buffet breakfast & Dinner (a-la carte restaurant available too). No visa or vaccinations are required for Irish citizens. Places limited.